Tinolang manok is delicious if native chicken is used. Rosales Rescue Team got stuck. October 9 Flood: Big Mak and Franks along Sansano St.
Bumaba na po ang tubig. Pero maputik pa din at giba giba ang bahay sa Tomana, Carmen at ilan pang barangays. 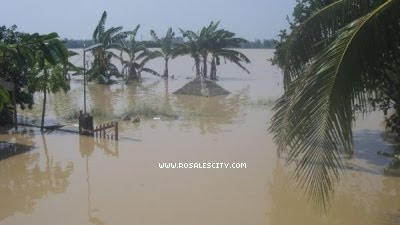 We're devastated by flood in Rosales Pangasinan. Many are still homeless. There is still no power. Smart and globe are up. SM was destroyed though I haven't seen it yet. Peace and order is okay, thanks to Mayor Ricardo Revita. Thanks to Ex Mayor Remigio P Yu for charging my phone for free and for offering some help. Thanks also to kagawad Jimlo Olegario and kagawad Perfecto Cezar. Special thanks to all volunteers, channel 7 and 2, President Gloria M Arroyo, AFP and PNP. Junction of Gen Luna St and Sansano St.